For the last few weeks, every time I think about what I want to read in the Bible, my mind is drawn to St. Matthew 8. It's funny, because I'll sit down and think, "What should I read today?" It's a really fun way to study the scriptures, because I believe the Spirit whispers where to go, and if I'm paying attention, or listening closely enough, I'll get a book, a chapter, and sometimes a verse. Then I get to figure out what I'm supposed to learn from it. Today, for the second or third time now, it was Matthew 8. So I opened it up, and as I got reading, I came to the part where Jesus entered a ship, and his disciples followed along. I always presumed that "disciples" = "apostles", but I don't think that's the case, as Matthew was soon called to "follow" Jesus in Matt. 9:9. (Unless these chapters aren't necessarily chronological, which is the case with some of the books in the Bible. I don't know if these disciples were accustomed to riding in ships. I, for one, am not. Boats kinda petrify me. Well, these disciples are on the ship, and a storm–"a tempest"–comes, and it says "the ship was covered with waves: but he was asleep". (Matt. 8:24) Ok... Jesus must really be a sound sleeper, unless they had fans and white-noise makers in his time. I would not have been able to sleep through that! The disciples wake him up, asking him to save them. 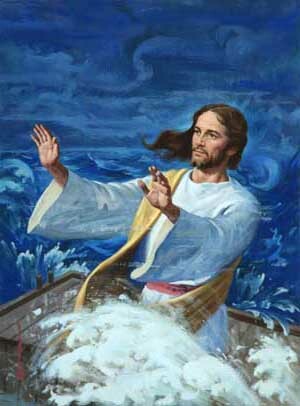 He then says, "Why are ye fearful, O ye of little faith?" Which begs the question –"Why are they fearful?" I'd love to hear your thoughts on this. It seems natural to fear for their lives. Of being cast into the sea. Of drowning. And Jesus, being all compassionate (when appropriate), would have realized this. So what was he really saying here? I just read Galatians 4 today. The message Paul was teaching the Galatians made me think of the people in the boat or even ourselves. The disciples being mortal could only see the life threatening effects of the storm. While Jesus, understanding the untapped ability these men could possess with their faith, was speaking about their lack of understanding. Like all of us mortals, most of us have a fear of death. It represents the end of what we know. Our spiritual faith is not yet mastered to understand its full level of capability. Even when Christ spoke to the apostles, many times he would say "do ye still not understand?" Christ knew the fear the men felt. He also knew they spiritually possessed the power to control the very elements that created that fear. As said in Galatians 4, are we bound by fear or free by faith. That's an excellent way to look at it. Just what I was looking for. Thanks, #1Mom!! !